When The Twit Hit The Fan: 'I'm Still Here,' Colbert Says : The Two-Way In his first show since a controversy erupted last week, Stephen Colbert poked fun at the media and himself, declaring that despite a #CancelColbert campaign on Twitter, "I'm still here." Stephen Colbert responded to criticism about a tweet about his show from his TV network Monday, saying he would dismantle the imaginary foundation that created the stir. In his first show since a controversy erupted over a Comedy Central tweet about one of his skits last week, Stephen Colbert poked fun at the media, his network and himself Monday night, declaring that despite a #CancelColbert campaign against his show on Twitter, "I'm still here." The tweet in question, you'll recall, referred to a Colbert skit that aired Wednesday in which he made fun of the Washington Redskins and the team's owner, Dan Snyder, for creating the Original Americans Foundation rather than changing the NFL team's mascot, as critics have demanded. Colbert responded to the controversy on The Colbert Report last night by saying he would shut down the imaginary foundation that sparked fury among his critics. The most vocal of those has been Suey Park, who tweets under the nickname Angry Asian Woman and who began the #CancelColbert campaign. In an article for Time, Park wrote last week, "The problem is that white comedians and their fans believe they are above reproach." She also discussed her motivations in an interview today with Huffington Post Live. A tweet from Wednesday stated, "White people — please keep #CancelColbert trending until there's an apology." The call to cancel The Colbert Report began Thursday, after Comedy Central's Twitter account for the show posted a note about his imaginary "Ching-Dong Ding-Dong Foundation for Sensitivity to Orientals or Whatever" — without placing the joke in its proper context. Responding to the anger over the tweet last Friday, Colbert wrote, "#CancelColbert - I agree! Just saw @ColbertReport tweet. I share your rage. Who is that, though? 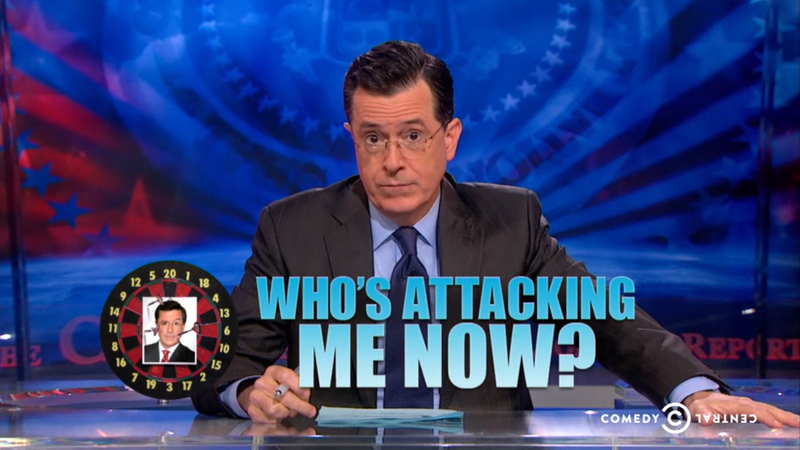 I'm @StephenAtHome" — referring to the account he uses. "Who would have thought a means of communication limited to 140 characters would ever create misunderstandings?" Colbert asked his audience last night. "When the twit hit the fan," he added, "the brain trust over at my network took the tweet down — because that's how the Internet works: You can just take stuff down, and no one will ever know it happened." After the #CancelColbert campaign gained momentum online, Colbert said Monday, "it was picked up by a small group of Americans who get their information only from Twitter: the news media." Monday night, The Colbert Report began with a montage about the show's possible demise, showing staffers carrying boxes out of offices, lights flickering out in the studio — and scenes lifted from commercials and disaster films. It was followed by a nearly 10-minute segment in which Colbert took his audience down a cultural hall of mirrors, calling the version of himself that made the joke a TV character, declaring (anew) that he is unaware of anyone's race, and expressing his deep disappointment that "my fellow conservatives abandoned me in my time of need." "A Web editor I've never met posts a tweet in my name on an account I don't control, outrages a hashtag activist, and the news media gets 72 hours of content. The system worked." Noting that the uproar on Twitter began only after he taped Thursday's show, Colbert said he was unable to respond until Monday (the show doesn't tape on Fridays). "So, in a sense I was canceled — for three days," he said. "Just like Jesus." Colbert blamed TV news channels for fanning the flames. And he urged his fans not to attack the "hashtivisit" who sparked the call to cancel his show. "If anyone is doing that for me, I want you to stop right now," he said. "She's just speaking her mind, and that's what Twitter's for — as well as ruining the ending of every show I haven't seen yet." Park has said she received death threats after the campaign against The Colbert Report began. A look at her Twitter feed also shows that she has passed along several insulting and profane messages from people attacking her, in addition to notes of support.